5 euros per month as flat fee and 1 euro per user per month. Pros: The position and hidden functionality works really well for us. Cons: We dont use the sign in button with social accounts. We sometimes get some errors when login in with this functionality. Overall: Students around South Africa doing Homeschooling and at learning centres are using this tool. Internet availability is a issue here, but the students download their subject's pdf books from this learning application and they can go on with their work offline. Recommendations to other buyers: The edit button on the right hand side should move down with the mouse scroll as sometimes i look for errors and if i find one i have to go back up to click edit button. good experience, I have used it as a student and as a teacher, has the basics to develop a course. Pros: It is easy to use and provides help within the same application on how to use it. It's free, you can use most functions without paying anything. allows you to send different types of certificate of course completion, free or paid. You have the option of creating the course for the student to complete at his own pace or at a time set by the teacher. It allows several types of access to the courses: paid, with invitation and confidential. the edition of the content of the course is simple and it admits images, audio and media embed in addition to mathematical formulas. Cons: the free version has publicity, it is not very intrusive but it bothers a little. Webinars are only available in the premium version. the translation of the application in other languages is not very good. the changes made in the course are not quickly reflected. You only have 2 task options to assign to students. does not allow assigning tasks to student teams. This the best free software's in the market, It is easy to use and visually very attractive. Pros: It is a software excellent to use for both teachers and students. Easy to set up classes, and add content. The software is easy to use. It is recommend for all. Cons: Sometimes the process to happen or you may not succeed therefore it is necessary to have some patience for the process. Overall: This software permits that the teacher to help the pupils in a fun way, easy and interact with them in a very friendly a way. Comments: Eliademy's E-Learning Platform is probably the most intuitive product for creating online courses by oneself. It needs little effort to have a professionell course ready and to offer it on the company's website. Users get certifications which are visible in the profile of social media such as LinkedIN. So for the ones who sell their courses online, this has a certain viral effect. Comments: Eliademy might be considered a disruptive Innovation (as coined by Professor Clayton M. Christensen). Eliademy is my e-learning platform of choice. It is easy to use, it functions well, and the customer support staff is always there when I need it. Comments: This is definitely one of the best free software's in the market. It is easy to use and visually very attractive according to my students. They like the layout and navigation system. 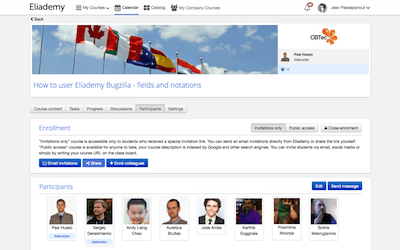 Eliademy is both a versatile learning management and a platform for virtual classrooms. Pros: Fairly intuitive to use for both teachers and students. Easy to set up classes, and add content. No need to be tech savvy. Good live feature to give real time classes. You canadd control features to check student progression. Cons: The sign up with linking process is a bit clumsy and the GUI is not that healthy. You would have to have some patience for the process to happen or you may not succeed sometimes. Overall its actually fine. Overall: Learnt how to help the pupils in a fun way and interact with them in a very friendly and a creative way .